There’s something about jello that’s so 1897. So Victorian. So old-school. So… over-the-top-retro. You see, 1897 is the magic year gelatin and fruit syrup were first combined to make the wobbly dessert we’re familiar with today. 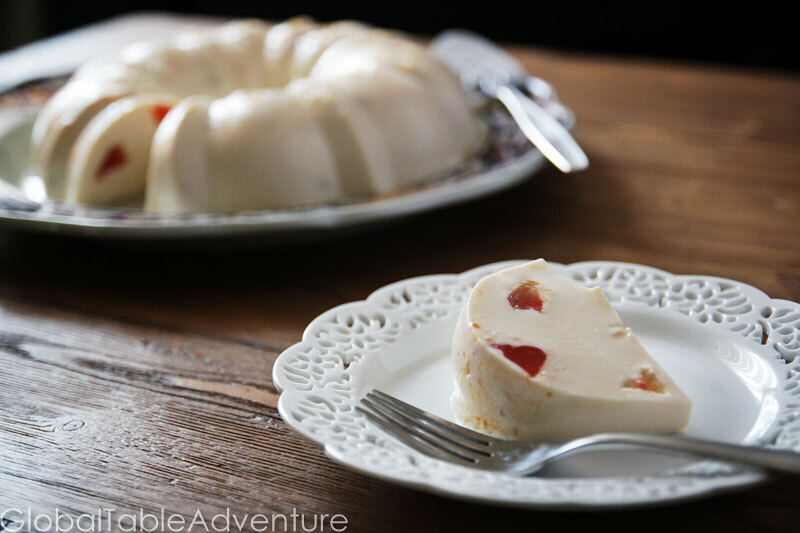 Fast forward through several decades and continents and you get today’s recipe, blancmange. It’s loaded up with evaporated and coconut milks, making it jello’s creamy counter part. It’s the reason Haiti’s get up in the morning. At least, I like to think so. This wibbly-wobbly dessert is fun for kids to make – you’ll find it at weddings and other celebrations. While it is not very sweet it is creamy, smooth and silky, almost like eating a wet coconut cloud. The tradition hails from France, where these sorts of molded desserts are extremely popular. Haiti was a French colony, so it’s only natural they put their Caribbean twist on the dessert. 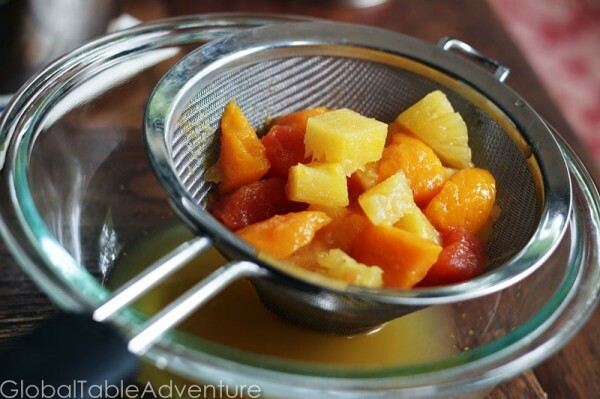 1 14 oz can tropical fruit cocktail, drained and diced small, or fresh diced fruit (like mango, pineapple, papaya etc). While you’re making this dessert, think back to your childhood. Did you eat jello? Did you like jello? Did all the wiggling weird you out? 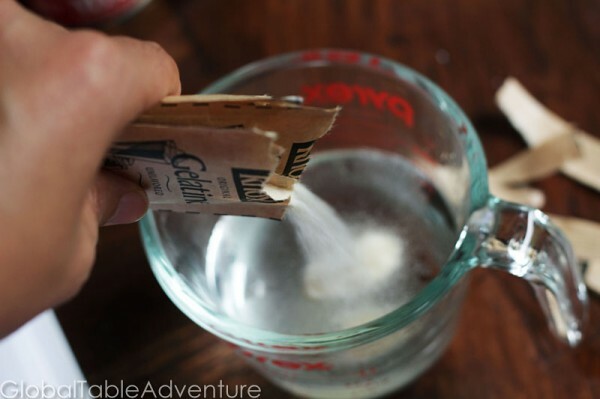 First, dissolve three packets of gelatin in warm water. Give it a good stir so there are no lumps. 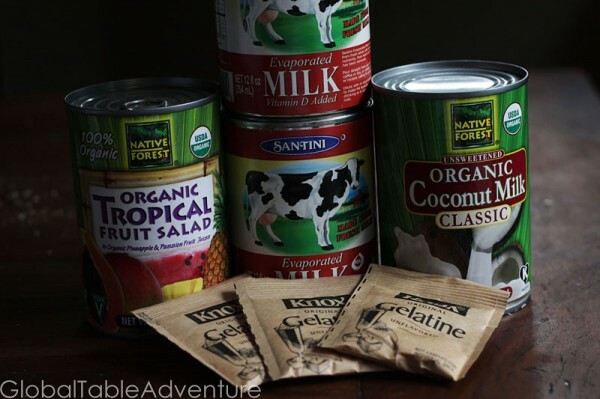 Next, whisk together the evaporated milk, coconut milk, and sweetened condensed milk. Add the gelatin and cook until almost simmering and gelatin is dissolved. Do not let simmer. Remove from heat. Strain fruit. I like to cut the pieces up smaller than this, so there is more juicy goodness throughout the dessert. You could probably even add more than this – play around with the recipe. Pour milk mixture into a lightly oiled mold. Evenly sprinkle the fruit around the mold. Chill for 24 hours. Loosen the edges with a clean knife and give a few wiggles until you see the blancmange shake loose from the edges. Invert onto serving plate. Slice with a sharp knife and eat on dainty plates, while drinking tea and dreaming about the most wonderful time in your childhood. 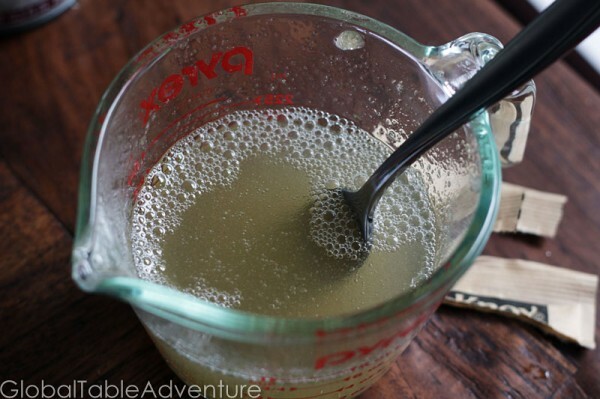 First, dissolve three packets of gelatin in warm water.Give it a good stir so there are no lumps. 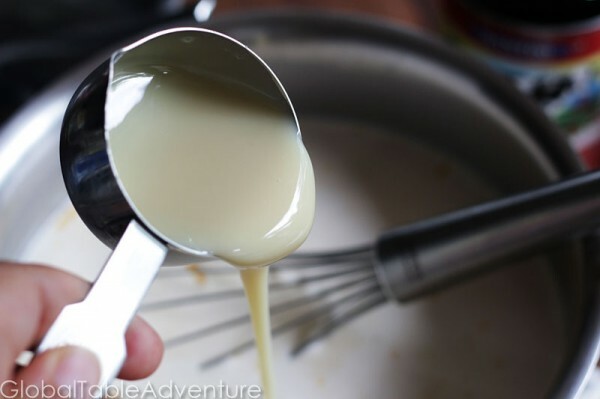 Next, whisk together the evaporated milk, coconut milk, and sweetened condensed milk. Add the gelatin and cook until almost simmering and gelatin is dissolved. Do not let simmer. Remove from heat.Strain fruit. I like to cut the pieces up smaller than this, so there is more juicy goodness throughout the dessert. You could probably even add more than this – play around with the recipe. 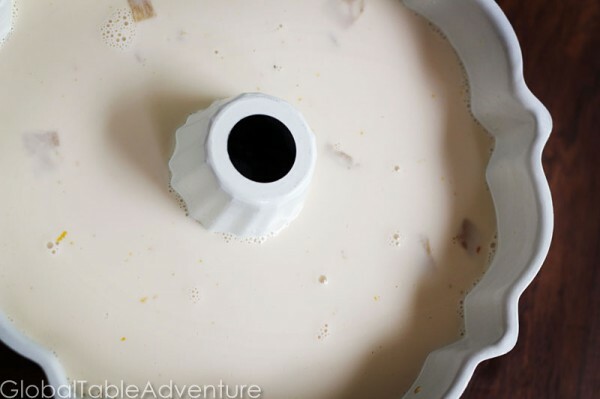 Pour milk mixture into a lightly oiled mold. Evenly sprinkle the fruit around the mold.Chill for 24 hours. Loosen the edges with a clean knife and give a few wiggles until you see the blancmange shake loose from the edges. Invert onto serving plate. Slice with a sharp knife. Wobbly wobbly! 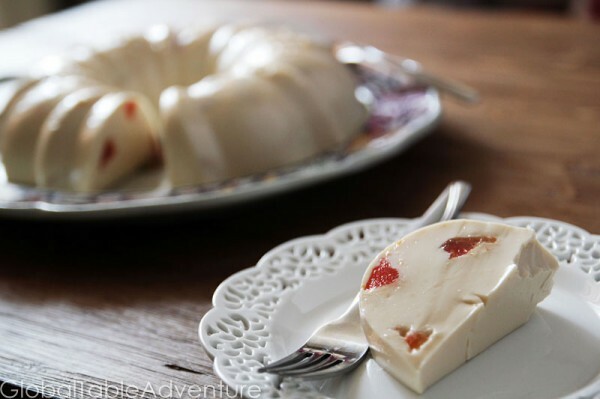 Jello is just fun…and this is especially tempting! 🙂 I’m glad I’m not the only one doing the jello dance .. ha! My umma is Haitian and we’re gonna try to make this together. It sounds so good. Though I have had the one that my PaPa (grandfather) makes, but he puts rum in it…. It’s a festive and delightful dessert. For me too, it brings very dear memories from my childhood . It doesnt say how much warm water to mix the geletin in. Anyone know? Sorry about that Janice! I just updated the recipe. It should have read 3/4 cup warm water… hope you enjoy it! this is my childhood blancmage recipes : 1 large container of sour cream 2 cans condensed milk 2 large cans mix fruits 1ts vanilla extra Pour to a beautiful glass bowls ,leaves in the frig fridge for a few hours till set and served .